My Roomies Story: Growing up I lived in a 3 bedroom home. I have one sister and one brother so inevitably my sister and I shared a bedroom. This would not have been such a big deal if my sister weren't the neatest neat freak I've ever met, while I am the polar opposite. I was the terrible roomie growing up. When I was maybe 7 years old I decided I wanted to hang on to my Easter eggs that year. And when I say Easter eggs I don't mean plastic ones. I mean dyed hardboiled eggs. I hid them under my bed and soon enough things got very smelly. My sister called them my 'Templeton's eggs' a la Charlotte's Web. Ok. Well that was embarrassing. 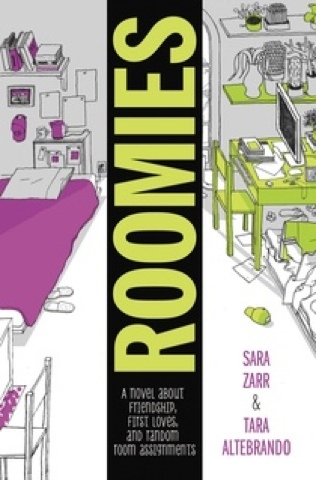 Now you tell me your roomies story (growing up, college, anything really) for an entry into the rafflecopter to win a paperback copy of 'Roomies'. I was in job corps and we had to share a dorm room with 1-3 girls and when you moved in you didn't know anything about them it was horrid at first! We each got a bunk 2 drawers and 1/4 of the world's tiniest closet!! We currently have a roommate. He is awesome! I was rooming withe three other people when i was truck driver training and was very weird. My only roomies are my husband and 2 boys so if you want to hear about them always peeing on the toilet seat that is about all I can share.